Featuring the very same material as used in our incredibly successful NT8 6-piece series we now introduce eight new 4-piece NT8 rods ranging from 9’ #7 up to a 15’9” #10/11 double hand slayer. NT8 rods are identified by a remarkable recovery kick in a rod that is Medium/Fast and loads deep and precise, generating increasing amounts of power as you ask for it. While still maintaining impressive lifting power for sinking lines, this deeper, yet fast type of action will work for a wide range of casts, lines and casting styles. By combining an ultra strong and responsive IM8 High Tensile Carbon material with Nano Tube particles through a proprietary bonding process, blanks with exceptional performance and strength are created. These rods have not only tested as the strongest rods we have ever produced, but they are also the lightest, making them a joy to use along rivers and coastlines during long, intense fishing days. 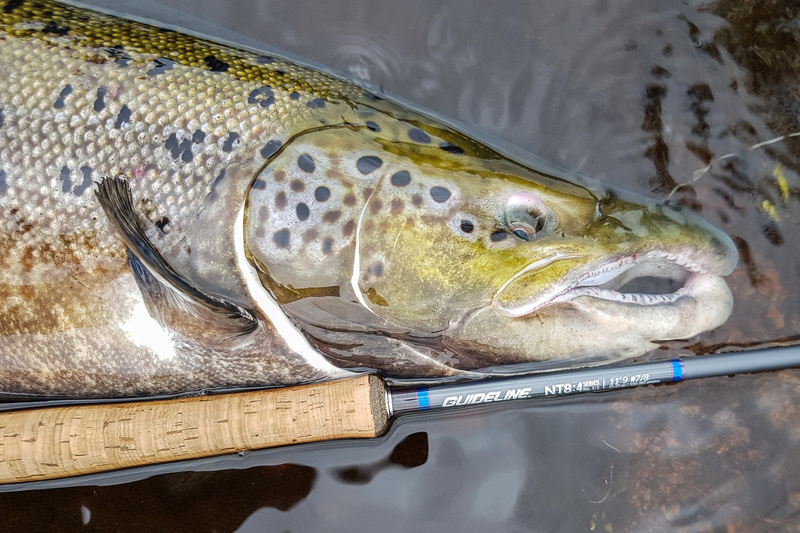 We have opted for two versatile, light and strong 9’ rods in line weight 7 & 8, aimed at saltwater fishing and fishing for large trout and salmon in rivers or lakes. We also introduce two new light and strong Switch models in 11’9 #7/8 and 8/9. Given the length, these rods are best suited for light double-handed work, but because of the light swing weight, they can also be managed as a long single hander. The double handed models are based on our most popular sizes; 12’9 #8/9 – 13’9 #9/10 and 14’9 #10/11 with the addition of a 15’9 #10/11 rod suited for large rivers, long distance casts and huge fish. Stories from the field #1 – Guideline NT8 Switch 11´9 #7/8. Andreas Möller – Guideline HQ Sweden. I´m one of those who really enjoy fishing with switch rods. The light feeling that you have in a single hand rod combined with the power and the control from a double hand rod is in my opinion the best benefits from two worlds. Especially when it comes to sea trout and salmon fishing in small and medium sized rivers. I think that there´s no room for mistakes when fishing for sea trout in low water conditions. A rod like this, that´s listening to my directives with full accuracy, will without doubt increase my chances to catch more fish. On my first session with the NT8 Switch 11´9 #7/8 I was more or less blown away! This rod has a lot of power and a quite fast action without being stiff. The blank has a wonderful crispy feeling with a sensitive tip which allow you to cast with full control and presentation. With small adjustments during your cast you can allow the line to land like a feather on the surface. My shooting heads are between 9 and 10 meters and weigh 21 grams. This weight is spot on in my opinion but you could easily use one or two grams more. I often use some kind of sink tip together with weighted flies and pretty long leaders. The power in this rod allows a great turnover with full control without having the fly smashing the surface. This is probably the perfect switch rod for sea trout and salmon fishing. Henrik Larsson – Guideline HQ Sweden. The westcoast sea run browns are plentiful but not that big, and my normal go-to rod is the RSi 9´ #6. But coastal fishing is a windy affair at times, and to up your gun to a 7-weight makes it much easier to present the fly and cover more water despite a stiff breeze. I paired the new NT8:4 with a sample of the new Coastal Evolve WF7 Slow Intermediate. It is an updated version of the old trusted Coastal, now with a taper with more punch, thinner shooting line and a color scheme with a hot yellow area in the back of the head. After some days out in the tail of coastal season 2018 I cannot but make this short summary; this setup is the sweetest coastal #7 kit I have fished in a long time. Despite being a 7-wt rod it feels light, crispy and is effortless to cast a full day, but with great power. Compared to the RSi series the NT8:4 rods are a little deeper but with a great power reserve in the bottom of the rod. Despite its power and long casting capabilities, it is still a very easy rod to cast because of its flex and action. When it comes to pike fly fishing I am an 8-weight guy. The norm these days are #9 and #10-weights but in most situations, I opt for a 9 foot #8. I do this for several reasons; first of all I am not a big guy and to fish long days I need a light setup to make it possible. I also wade a lot, which makes heavy gear and big flies even harder to cast when you are in a low position and not fishing from a boat. So in short I use pretty light gear, fish by foot and use light, slim and non-absorbent flashabou flies on single hooks. This way I can cover lots of water and fish day in and day out without being to tired after a long weekend in the shallow bays of south Sweden. Just like the 7-wt the new NT8:4 9 feet #8wt is light and crisp but with a little deeper flex then the RSi rods. For the shallow waters I fished this trip I used only floating lines, and tried samples of the new Predator lines. If you want a perfect match with a light feel you go for the WF8 lines, but I also tried the WF9F Predator DX, and the rod handle it with beauty and the extra flex and bottom kick did deliver a little bigger flies with ease.